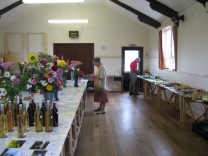 Chittlehampton & District Garden Show & Fete is held in the Village Hall & surrounding grounds, Chittlehampton. In 2019 the Show will be in its 78th year. It is held annually on the second Saturday in August, and in 2019 it falls on 10 August. It opens at 2 pm. Proceeds in aid of Village Hall Fund. Have a look around the website and see the fun that was had at the 2018 Show. Do please think of exhibiting in 2019. We would be so delighted if you would join us and you do not need to be an expert. Councillor Walter White and Show Judge kindly opened the show in 2018 and presented the prizes. Have a look at the slide show below of exhibits and judging from 2018. Hopefully they will give you inspiration for your exhibit this year! 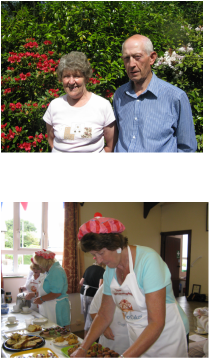 Derek Matthews stepped down as Secretary of Chittlehampton Garden Show in August 2011 after 31 years at the helm (pictured here with his wife Margaret who is Homecraft Secretary and a member of Chittlehampton Social Club). Derek has been passionate about plants since he was a child and is very keen for young people to come forward to ensure the Show's success continues. Luckily for Chittlehampton, Derek will still be exhibiting and supporting the Show; gently ensuring that his successor gets it right! He has done an amazing job over the years and will be a very hard act to follow! Rose and her team of Cup Cakes, formerly Chittlehampton Tea Bags, decided after 9 years to let someone else serve the teas from 2013. Many thanks to Rose & Co for all their efforts. Brenda & Co now run the teas very successfully. Also stepping down from her role as Steward supporting Derek is Cynthia Cockram. Cynthia has been quietly following the judges around and taking note of the scoring (pictured here in action with judge, Peter Cole). Another key role has been ensuring that the content/number of exhibits is correct trying not to let anyone be disqualified. Many thanks to Cynthia for her years of support. We cannot date this picture but it is taken from a clipping out of the paper when The Matthews family won a 'family hat trick' at the Show one year. Derek won the cup for most points, his wife Margaret won the Women's Institute Cup and his mother was runner up in the WI Section. 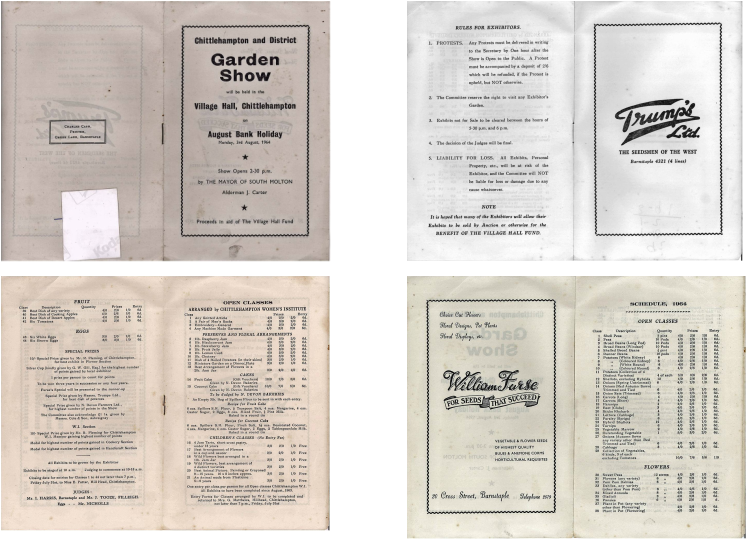 The first Chittlehampton Garden Show to aid Red Cross Funds was held in 1942 on August Bank Holiday. According to an extract from the North Devon Journal it was a great success and the Secretary & Treasurer at the time was Mr J. R. Burgess. Curiously the Journal is dated 13 August 1942 - was August Bank Holiday earlier then? During the afternoon variety shows were given by Mr Spencer Vivian and Skittling was held in the Reading Room. There was a Baby Show and Lorna Phillips won for 12 months; and Eunice Andrew won for 1-2 years. Mrs W. Stone won the Best War Time Cake. The serving of tea was supervised by members of the Women's Institute. The days proceedings concluded with a Whist Drive and Dance when the Vicar (the Rev R. Seymour) thanked everyone who had assisted in making the day such a great success. All of the exhibits were sold in the evening and realised a considerable sum for the Red Cross Fund. Mr J. R. Burgess reported a credit balance of £65 2s. 10d. In an extract from the North Devon Journal dated 12 August 1943 entitled, Chittlehampton's Red Cross Week, competitions helped to swell the funds and over £200 was raised. During this week a sports programme was held, a Dance, Whist Drive, Maypole Dancing, Punch & Judy, Cricket Match (Veterans versus the Rest), Skittles Competition and Concert. It seems the Veterans won the match by a substantial margin!